Already she’s nearly eighteen. No sign of destiny yet, but Mary’s certain he’ll be handsome. Then she meets the reformer, this Mr. Samuel Brown. Destiny is closer at hand than Mary has supposed—if she can just get Mr. Brown to realize it. I have read all but one of the Matchmaker books and this is one that had elements I liked and some I disliked. Generally, I enjoy Regency/Victorian period fiction. 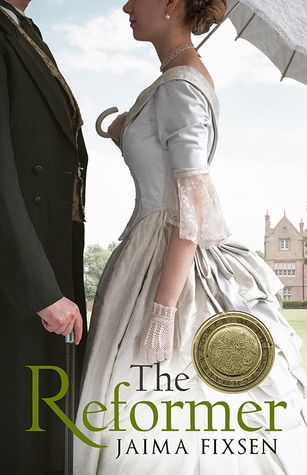 This book involved more of the political upheaval of the 1830s that you would normally get in a typical romantic novel, and this was something I did enjoy because it was integral to the storyline. Mary is a character that it is easy to feel sorry for. She has been raised in a family that seems to not care much for her, she has little to no freedom, yet she is generally a kind, considerate, and positive young lady. I did not care for Mary's family members much at all, though due to Ms Fixsen's wonderful character development, my opinion had changed toward her father by the end of the book. Mr Brown & Mr Murray are both heroes that a reader (and Mary) can fall for. Of course, I had a preference for one over the other, but I found that what I really enjoyed about the men was that they weren't stagnant characters. Mr Murray's character grew and developed as the story unfolded in a most pleasant way. He is a wonderful friend to Mr Brown and an all around good man, even if he sometimes makes poor judgments due to lack of knowledge/experience. Mr Brown was easy to fall for from the start and by the end, we find he's more than just a pretty face obsessed with reform. Miss Pearl was a delight in this installment. I loved that she had an active role throughout the book and I really enjoyed that she was working with more than one match. The subplots were just as enjoyable as the main storyline. FYI - clean read though there is a scene where Mary reads a medical book about reproduction - so not "squeaky clean"